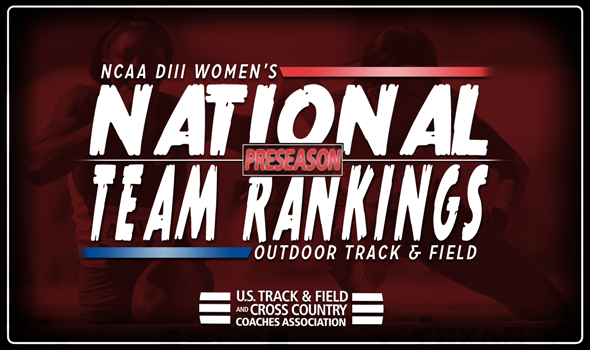 NEW ORLEANS – It will be a tight race for the NCAA Division III Women’s Outdoor Track & Field team title in 2018 according to the Preseason National Team Rankings released Wednesday by the U.S. Track & Field and Cross Country Coaches Association (USTFCCCA). The top-5 teams – No. 1 Ithaca, No. 2 Williams, No. 3 UMass Boston, No. 4 MIT and No. 5 Claremont-Mudd-Scripps – are all within five points of each other. This is the first time in program history that the Bombers have been ranked No. 1 outdoors. Ithaca finished runner-up last year at NCAAs and return two major reasons for that success: Taryn Cordani and Katherine Pitman. Cordani enters the season ranked No. 1 in both the 5000 and 10000, while Pitman is the NCAA DIII record holder in the pole vault. The Ephs don’t have any top-ranked athletes, but several in the top-5 of their respective events. Emma Egan and Helene Hall are billed No. 2 and No. 4 in the high jump, while Anna Harleen is ranked fourth in the 1500. Kate Kennedy (400 hurdles) and Carmen Bango (steeple) could make some noise as well for Williams, which tied a program high-water mark with this ranking. Wadeline Jonathas and Taylor Driggers are the rocket fuel for the Beacons outdoors, just like they were indoors. Jonathas and Driggers combined for 46 points in a title-winning effort under a roof and should place well in their events outdoors. Jonathas just broke the NCAA DIII record in the 200 with her time of 23.29 and Driggers is ranked fifth in the triple jump. Jonathas also sits atop the preseason rankings in the 100 and 400. The Engineers are hoping to see big things from Jenna Melanson in the steeple and Nneoma Okonkwo in the long jump. Hannah Chen could also provide double-digit points between the 100 and 400 hurdles. Tyra Abraham and Bryn McKillop are looking to put the Athenas back on the podium. Abraham and McKillop are both ranked in the top-8 of both of their respective events, with the former in the 100 and 200, and the latter in the 1500 and 5000. The rest of the top-10, in order, is: No. 6 Ohio Northern, No. 7 UW-Eau Claire, No. 8 Oberlin, No. 9 Nebraska Wesleyan and No. 10 Whitworth. Be sure to check back in throughout the season as we lead up to the 2018 NCAA Division III Outdoor Track & Field Championships held May 24-16 in La Crosse, Wisconsin.